Think in layers. With clothes that can be layered, you can pack less and be warmer or cooler when needed. Always have a "buy-it-there" money stash, so you can buy upon arrival the things you might need like shaving kit (see below when I talk about my dopp kit), etc. This money can serve too in an emergency, when you need to buy a pair of pants because you spilled wine in the one an only pair you brought. Take a minimal amount of toiletries. Buy the rest there and dump them before you return home (see previous). Don't use a wheely suitcase as carry on. Bring a backpack or duffel bag. For your clothing, choose just three colors you look good in; make certain everything matches. Don’t worry about wearing the same outfit several times. Most people you encounter will see you only once. Check the weather 1 day before your trip and pack accordingly. This will ensure you have the best options for the weather. When you buy things, like presents or souvenirs, ship them home. Make certain you have one comfortable pair of shoes that can be worn with most of the clothes you selected. Whenever possible, wash your underwear in the hotel/place you are staying. If you have the right underwear (syntheric), they will dry overnight. Think light on electrocnics. Do you really need a laptop, iPad, iPhone, ebook reader and camera? Not to mention all the cords? Always pack a Booboo Kit or at least a minimal first aid kit. Leave your oversized, thick wallet at home. Bring only the needed cards/ID and some cash. Leave all your coupons at home. I use a GORUCK GR1 21L (AKA GR0). Hands down the best piece for packing light. I've packed in this ruck clothing and gear for up to 25 days on the road. When I need more, and this is usually when I need to bring tactical gear, I go with a GR2, but this is rare. The GR1, and all rucks from GORUCK really, have a perfect balance between durability, organization and easy of use. They open flat, allowing for fast and easy access to all the items. They have internal pockets and MOLLE, allowing for great organization. And they don't have unnessesary straps all over the place, making it easy to move around without fear of them getting caught on soemthing. They are durable, blend in great and can literally help you pack lighter. Sure, they are expensive. But, like all the stuff you will see in this article, I believe in spending the money once and that's it. One thing I learned while I was in the military, and continue to learn every time I pack for a field project or operation, is how to organize my stuff. It helps to keep packing to the minimum, it helps to fit everything I need and it helps when you are trying to find soemthing. I always pack the same way, I always put the things on the same spot. Inside the same pockets or pouches. While I use the pockets inside the GORUCK rucks, when it comes to clothing and toiletries, I use a series of pouches and organizational things. I also bring sometimes a GORUCK Wire Dopp when I need extra organization for wires and electronics. As you can see, it really helps keep the stuff organized. Toiletries, the Dopp Kit. This is an item where people go crazy. You can see people bringing in the whole house inside a toiletries bag. I bring only little things. I buy shaving stuff and heavy things when I arrive at my destination. Travel size shampoo and hand sanitizer. Anything else I need I can buy when I arrive: Shaving kit, soap (if I need and not on a hotel), hydration cream, etc. Having a small Dopp Kit is great: you can fly thru security, you can pack it everywhere, including on a small ruck for a 1 day trip. Find what works for me, but the list above has been working for me for the last 10 or so years. Yes. We've all been there. Don't do it. There is no real way to make this lighter other than just bringing only the things you need. I found that most of the time I can do with a MacBook Air 11" and my iPhone. This means only 2 wires and one emergency power battery (solar rechargeable) for when I'm in the field. I use usually one of GORUCK little sleeves for small items as the iPhone charger, USB drives or outlet convertors (for international travel). Or for bigger items, I just use the ruck's own pockets. Check The Brooks Review article on travel electronics for a more comprehensive and well written note about this. Now, like I mentioned in the beginning, layering is key. Undershirt: Patagonia Capilene or Arc'teryx Phase SL. These items dry fast and can adapt to variable conditions / trips. 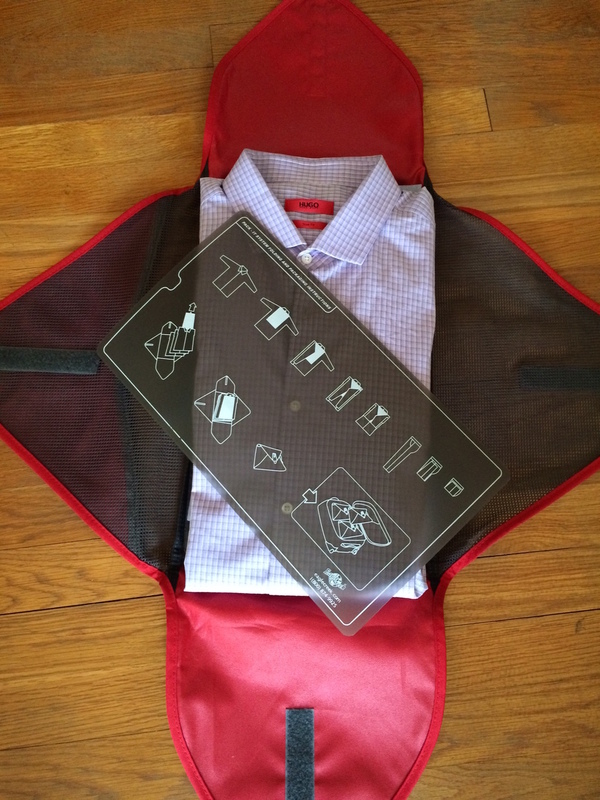 For business trips I pack a suit on an Eagle Creek Pack-it Garment Folder, and that goes inside my GR1. The suit comes out almost perfect. I usually have to iron it a little here and there at the hotel. When I can bring business casual clothing, I wear a pair of Bluffworks Chinos, which are easy to care for and look sharp on and off the meetings. Also, items such as the Arc'teryx Skyline shirt and other iron-free shirts make it easy to move between relaxed meetings and a night in town, to the field. In terms of jackets, I usually go with a ultra-packable Arc'teryx Atom LT for winter, and a light-weight Patagonia R1. For rain, usually a softshell will suffice. If I'm in the field, well, that's a whole other story and a subject for a different post. So, now you know why and how I pack light. Packing light has benefit. Find what works for you and try it. Now go out and travel.